Makki ki roti reminds me of lush green fields and roadside dhabas of Punjab. Dishes of Punjab have liberal amounts of pure ghee and home made butter. If you have difficulty in rolling out makki ki roti, that is, it sticks and breaks, then there is one solution. Roll it between greased plastic sheets, it's much easier. 1. Mix all the above ingredients except ghee (or oil). Use warm water to knead them into medium soft dough. 2. Take a polythene bag and tear it into 2 halves. Grease them both on 1 side. Keep one piece on the chakla (rolling platform), greased side up. 3. Take 1 ball of dough and put on the polythene. Cover with other piece of polythene, greased side towards the ball. Roll out a roti between the greased polythene pieces. 4. Heat a tawa (griddle). Place makki ki roti on it and cook both sides brushing with ghee (clarified butter). Cook till both sides are golden brown. 5. Serve hot makki ki roti with a dollop of white butter on top. 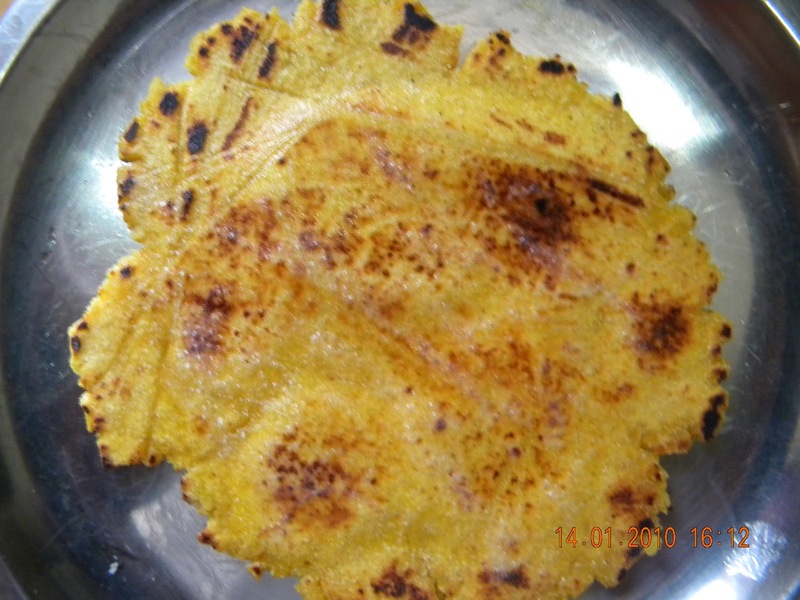 You can also add grated mooli (radish) in place of methi leaves. Very finely chopped onions can also be added to the dough.